Pancontinental Resources Corporation (“Pancon” or the “Company”) (TSXV:PUC) (“Pancon” or the “Company”) has completed its first exploratory drill program at the early stage Montcalm Ni-Cu-Co Project, adjacent to the former Montcalm Mine owned by Glencore, 65 kilometres northwest of Timmins, Ontario. Pancontinental Resources Corporation (“Pancon” or the “Company”) (TSXV:PUC) (“Pancon” or the “Company”) has completed its first exploratory drill program at the early stage Montcalm Ni-Cu-Co Project, adjacent to the former Montcalm Mine owned by Glencore, 65 kilometres northwest of Timmins, Ontario. The purpose of the maiden drill program was to test airborne virtual time-domain electromagnetic (VTEM) geophysical anomalies identified in 2018. All assay results have been received from 10 diamond drill holes which produced approximately 4,300 metres of drill core. The former Montcalm Mine is situated in the large, continuous Montcalm Gabbro Complex, and is the only known mineralized occurrence. The Ontario Ministry of Northern Development and Mines’ (MNDM) 1990 GEOTEM Survey (Map 81360) identified 11 EM anomalies in the area covered by the combined land positions controlled by Pancon (Montcalm Project) and Glencore (Montcalm Mine). The former Montcalm Mine is coincidental with 3 of those 11 EM anomalies. 6 of the 11 EM anomalies from the MNDM Survey are associated with a complex magnetic feature called the Hook zone. These 6 anomalies are proximal to each other and form two east-west oriented trends which follow the magnetic pattern. The magnetic pattern in the Hook zone has a curved hook shape (see map below), indicating local change in strike direction. This change in strike direction posed a problem for the VTEM line orientation, and thus Pancon’s subsequent drilling orientation. This would explain why Pancon’s 2 holes in the Hook zone did not intersect mineralization. Pancon’s 2 strongest VTEM anomalies are both located in the Hook zone. They were not explained by drilling, remain viable targets and are the subject of ongoing reinterpretation. The 6 EM anomalies in the Hook zone have not been explained by any of the previous exploration programs. Pancon is currently conducting IP surveys and a geophysical reinterpretation on the Hook zone in anticipation of follow-up drilling as soon as possible. The Montcalm Project (3,780 hectares, 37.8 square kilometres) is located within the prospective Montcalm Gabbro Complex in the Montcalm Greenstone Belt, 65 kilometres northwest of Timmins, Ontario. 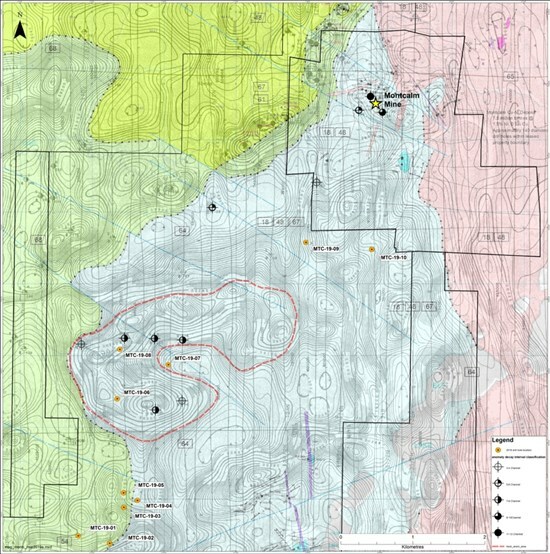 The Project is contiguous to and surrounds the western, northwestern and southwestern portion of the former Montcalm Mine, which was discovered and developed based on a single airborne electromagnetic anomaly identified in the 1970s and previously mined 3,931,610 tonnes of ore grading 1.25% nickel (Ni), 0.67% copper (Cu), and 0.051% cobalt (Co), producing in excess of 4 million pounds of Co (Ontario Geological Survey, Atkinson, 2011). The Company cautions that the mineralization on this adjacent property is not necessarily indicative of the mineralization that may be identified on the Company’s property. In January 2018, Pancon acquired an option to earn a 100% interest in the Montcalm Project, as well as in the nearby Nova Project, as detailed in its January 10, 2018 news release. The technical information in this news release has been prepared in accordance with Canadian regulatory requirements as set out in NI 43-101 and reviewed and approved by Todd Keast, P.Geo., a Qualified Person as defined by NI 43-101. Mr. Keast is a member of Pancon’s Technical Advisory Committee and Pancon’s Projects Manager. Certain technical information within this news release is historical in nature and pre-dates NI 43-101 standards; this information is believed to be reliable however the Company has not verified this material. Pancontinental Resources Corporation (TSXV: PUC), or Pancon, is a Canadian-based exploration company with a mission to generate value through responsible exploration of prospective assets proximal to producing/former mines in low-risk areas. Pancon holds five nickel-copper-cobalt projects in Northern Ontario. The Montcalm Project, Gambler Project, Nova Project and Strachan Project are adjacent to and near the former Montcalm Ni-Cu-Co Mine located 65 km northwest of Timmins. 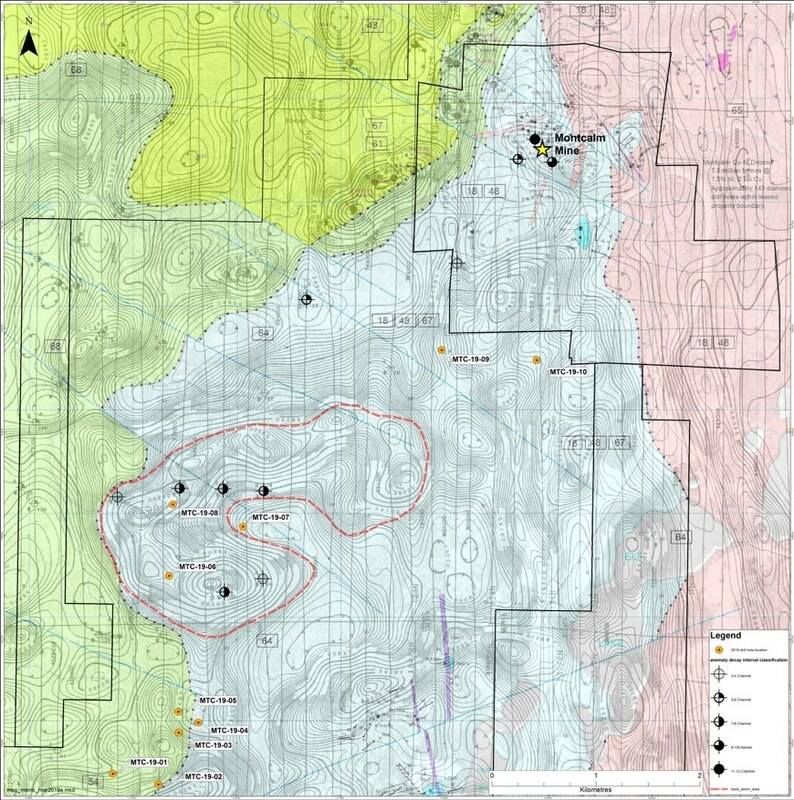 The St. Laurent Project has an advanced Ni-Cu-Co-Au-Pt-Pd target and is located 50 km south of Detour Lake Mine and 20 km southeast of Casa Berardi Mine. The Company also holds a 100% interest in the Jefferson Gold Project near Haile Gold Mine and adjacent to the former Brewer Gold Mine on the Carolina Gold Belt in South Carolina, USA. Click here to connect with Pancontinental Resources Corporation (“Pancon” or the “Company”) (TSXV:PUC) for an Investor Presentation.